We are glad to inform the public, especially our supporters, that last September 26, we workers of NXP-Philippines signed a Collective Bargaining Agreement (CBA) with the management of NXP-Philippines, effective for the years 2014-2016. The signing of the CBA marks the end of our recent struggle to secure improvements in our working conditions by securing improvements in the CBA, which was met by the management with the illegal dismissal of 24, or almost all, of our union leaders last May 5, 2014. This is a victory against the management’s attempt to bust the NXP Semiconductors Cabuyao Incorporated Workers’ Union-National Federation of Labor Unions-Kilusang Mayo Uno (NXPSCIWU-NAFLU-KMU). It was also clear that the management was provoking us into carrying out actions which it could use as a pretext for outrightly busting our union. It wanted to deny us NXP workers of what we deserve: an improved CBA which contains a significant wage hike and the regularization of contractuals. This is a victory of the Filipino workers and people. The NXPSCIWU-NAFLU-KMU is one of the oldest and biggest unions in the country. It is also one of the few unions in the country’s special economic zones, which are known for being havens for contractual employment and being very repressive of workers. With this victory, an important union is strengthened and steeled, serving as an inspiration to Filipino workers hoping to unionize. Our struggle underscores the necessity and possibilities of forming unions. Twelve out of the 24 illegally-dismissed union leaders will be reinstated while the 12 who will not be reinstated will be given a decent separation package. The wage hike for the workers will be as follows: 5.25% for the first year, 3.5% for the second year, and 3.5% for the third year. Less than two hundred contractuals will be regularized. An agreement was reached stating that all cases that were filed in relation to this labor dispute will be dropped and no retaliatory actions will be undertaken by both parties. We wanted more with regard to the number of officials who will be reinstated, to the wage hike that will be implemented, and to the number of contractuals who will be regularized. It is clear, however, that what we got constitutes a significant improvement from what the management was willing to give at the start. It also became clear to us that the management would go no further in acceding to our demands and that sacrifices had to be made on our part to get the best deal given the existing conditions. We salute the rank-and-file members of NXPSCIWU-NAFLU-KMU without whose unity in principle and action, courage, and determination, this victory would not have been possible. Our heartfelt “Thank you!” goes to our supporters: our families, fellow workers and union members, progressive sectoral organizations and partylist groups, pro-worker institutions and legislators, Filipino migrant communities in various countries, workers and unions in various countries, and global workers’ organizations. Many lessons were affirmed in the course of this struggle. 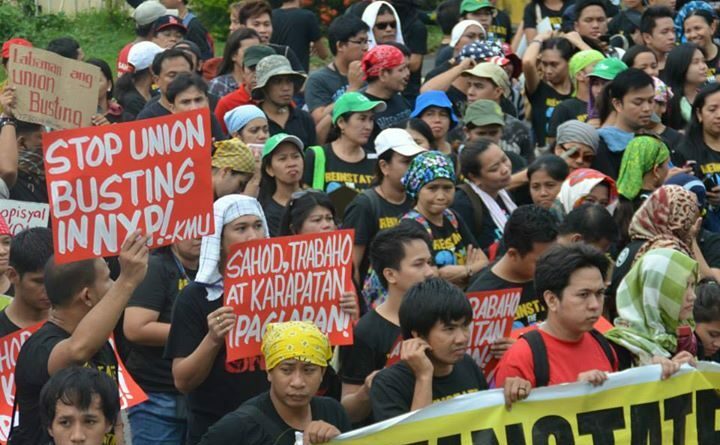 Foremost among these is the need for unity and collective action in defending and upholding workers’ rights. Struggling against a multinational giant like NXP Semiconductors indeed entails unity and collective action at so many levels and in so many forms. This struggle is a most memorable experience which we will draw inspiration from for the rest of our lives – inspiration in continuing to work for unity and collective action for workers’ rights. We know that under the present socio-economic system, victories of workers and ordinary people are always temporary and fragile and can be taken back by the ruling elite. We vow to be vigilant in guarding this victory and to continue consolidating and strengthening our ranks. We vow to help other workers form unions and fight for their rights. We vow to develop broader and stronger unity with fellow workers and other sectors of society in fighting for workers’ rights and for fundamental social change.